Miami Trace/Great Oaks FFA members recently attended FFA Camp Muskingum. From July 5-9, 30 Miami Trace/Great Oaks FFA members attended FFA Camp Muskingum. Located in Carroll County on the banks of Leesville Lake, Camp Muskingum offers a unique outdoor experience. The lake, hillside and forests offer prime opportunities for aquatic and nature studies. Members in attendance ranged from eighth grade to recent graduates. These students included: Aubrey Schwartz, Abbi Pettit, Morgan Eggleton, Anita Pursell, Preston Huff, Garrett Hagler, Grayson Keller, Wyatt Atley, Luke Anders, Graham Carson, Kylan Knapp, Connor Collins, Tyler Cummings, Addy Little, Reagan Barton, Luke Carter, Kyle Bennett, Rebecca Heckathorn, Drew Black, Jeremiah Dougan, Bryce Bennett, Caleb Bennett, Weston Pettit, Dylan Lovett, Blayne Ferguson, Libby Alehire, Jenna Goddard, Nathan Molloy, Ben Speakman, and Emma See. Throughout the week at Ohio FFA Camp, members were able to interact and learn from the newly-elected Ohio FFA Office Team as well as past state officers that served as staff during the camp. Students took part in leadership workshops, team building activities and outdoor recreation. Some of these activities included motor boating, kayaking, canoeing, paddle boarding, shotgun and rifle ranges, paintballing, several sports, swimming, dances, and meeting new friends from other chapters across the state. FFA Camp is a great experience for anyone who can attend. The Miami Trace FFA is a satellite student organization of Great Oaks Career Campuses. 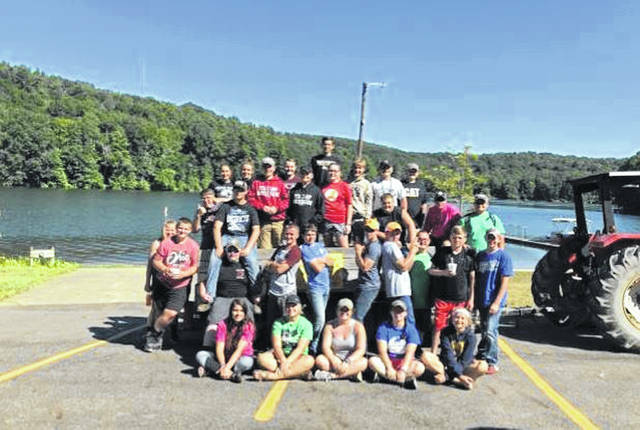 https://www.recordherald.com/wp-content/uploads/sites/27/2018/07/web1_CampMuskingham.jpgMiami Trace/Great Oaks FFA members recently attended FFA Camp Muskingum.